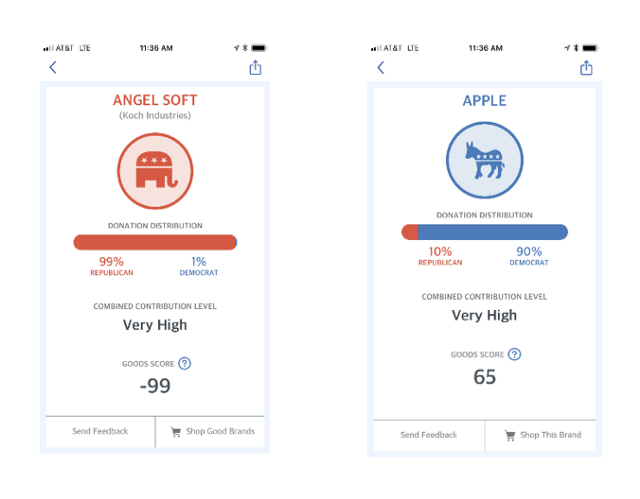 On July 25, 2018, at a demo day in front of a room full of investors in Silicon Valley, California, Goods Unite Us released a free, first-of-its-kind rating tool that allows users to see how their own purchasing habits impact politics. To use it, you just need to answer ten questions about your own purchasing habits (where you shop for groceries, what kind of car you drive, where you bank, where you buy clothes, etc.). And then the tool uses average consumer spending data and our database of political information on nearly 4,000 brands and companies to calculate whether your purchases are helping Democrats, Republicans or both! If you’ve read our blog before, you know that Goods Unite Us currently maintains a free website and iOS app that includes political donation information for nearly 4,000 brands and companies. And in the next few weeks, we’ll be rolling out features that give users tips on how to best change their ratings if they don’t like them. So, for example, if you’re a Republican but your purchases help Democrats, we’ll tell you what areas of your spending (credit cards, phone companies, etc.) are most impacting your percentage breakdown and Campaign Finance Reform Score. And we’ll recommend some companies that you can support instead of the ones you’re currently purchasing goods or services from to help change your ratings. At Goods Unite Us, our mission is to provide more transparency around corporate money in politics. And now — not only can you use our website and app to see who companies and brands are supporting — you can more easily take matters into your own hands!